During my visit to the New York Comic Con 2012, Simon & Schuster representatives hooked me up with a copy of StarCraft II: Flashpoint by New York Times Best Selling author Christie Golden. I finished reading the book, and it’s very hard to contain myself, and not spoil things. I’ll do my best not to reveal the entirety of the plot, but at least enlighten you with an attempt to spark in you the interest to read this book. StarCraft II: Flashpoint literally bridges the gap between StarCraft II: Wings of Liberty and StarCraft II: Heart of the Swarm. I’m almost convinced the expansion will start off with Sarah Kerrigan leaving the Umojan Protectorate to start her search for the Zerg. The Umojan Protectorate is a non-Terran Dominion territory that many fans have probably wanted Blizzard to put into the spotlight in-game as it has in the Tokyopop StarCraft: Frontline manga. One can only hope. The first chapter introduces readers quickly into the exact moment two seconds after Jim Raynor shot his handgun at Tychus Findlay. The novel gets to portray what the game nor the StarCraft II: Wings of Liberty final cinematic could. What was going on through Jim Raynor’s thoughts right after shooting his best friend. His reaction to seeing Sarah’s face as he carried her body outside the cave, as he looked into the horizon of Char’s surface. Valerian Mengsk meditates aboard the Bucephalus battlecruiser, orbiting planet Char. Ignorant of what’s happening down there. Whether Jim survived, whether the Xel’Naga artifact worked, or if Sarah had been reverted into human form or not, or if she survived the transformation. I was glad to read Valerian remembering R.M Dahl and Professor Jacob Jefferson Ramsey (main characters of StarCraft: The Dark Templar trilogy ). I was surprised to read the idea the Xel’Naga artifact could change the Queen of Blades back to human form was actually an idea proposed behind-the-scenes by Jacob Ramsey. This piece of information was never mentioned in-game in Wings of Liberty. However, it makes sense. Single-player lore fans no doubt wondered at some point how Valerian knew so much about the Xel’Naga artifact and what it could do to Kerrigan. This is the perfect reasoning. Jacob Ramsey is not only the best archeologist in terms of ancient Protoss and Xel’Naga ruins and objects, but as read in StarCraft: The Dark Templar trilogy, his brain hosted the mind of a Protoss Preserver named Zamara; and learned her knowledge and that of countless Protoss’ memories throughout history. Personally, I would have liked to see Jacob in-game in Wings of Liberty to provide the background and purpose of the Xel’Naga artifact. Nevertheless, StarCraft: Flashpoint does a great job filling readers in on what transpired behind-the-scenes in StarCraft II: Wings of Liberty’s plot. Not all stories mesh well in-game as it can in a novel. The novels have more room to flesh out things. Nobody wants to sit tight listening or watching cutscenes for 5 minutes. Gameplay comes first and foremost. Raynor’s dropship lands within the Bucephalus battlecruiser, Valerian’s flagship, to offer medical treatment to Sarah Kerrigan. Things get a little jumpy as Raynor doesn’t trust Valerian, and Valerian very well knows what Raynor is capable of for her safety. However, what readers will find in chapter three is pure gold. You have never seen Prince Valerian Mengsk like this before. His true intentions throughout previous novels and throughout StarCraft II: Wings of Liberty is revealed. Is he as treacherous as his father? Or is he a different person? I was hoping to see a sliver of the Queen of Blades somewhere in Sarah, but the author is blunt and straight to the liver. This is no longer the Queen of Blades. We truly face Sarah Kerrigan’s humanity — mind and soul. I realize not everyone who plays StarCraft II, plays World of Warcraft or have read Christie Golden’s novels based on Warcraft. Many do. I have read all the Warcraft, StarCraft and Diablo novels. Call me a lore buff. I can tell you upfront. 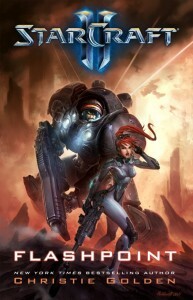 I love the twists, humor and the plot creativity of Christie Golden in StarCraft: Flashpoint. It feels much different than her work in the Warcraft universe, but she brings with her several years of experience writing Star Trek novels, and she got a deep and mature knowledge of the StarCraft universe, its characters, lingo and the locations throughout the Koprulu Sector. I really hate to read novels that look more like poetry in motion than a novel — you know, describing something simple in so many fancy and sweetened words that it takes three pages to say it. That style doesn’t mesh well with sci-fi. Christie is fluid, and constantly pumping action from page to page. The story moves forward at a good pace. Christie Golden added several continuity nods throughout StarCraft: Flashpoint. Some of these nods come in the shape of adult language or lingo often seen around Keith R.A. DeCandido stories such as StarCraft: Ghost–Nova, StarCraft: Ghost–Academy and StarCraft: Ghost–Spectres. There are several flashbacks in this novel from the point of view of Jim Raynor — visiting the memories of the moment Sarah requested an evac, but Mengsk belayed the order and abandoned her to the Zerg. Lots of these flashbacks are based on factual continuity as sort of behind-the-scene stories players never got to see in the original StarCraft single-player missions. Sarah at some point recalls when she first met Jim Raynor and Michael Liberty in Antiga Prime. The dialogue from the original StarCraft game is used word by word, which is a very nice touch. That scene where Jim and Sarah meet for the first time is very iconic when he realizes she is a telepath after she calls him a pig. There are other flashbacks to year 2500, where the reader gets really close to Jim Raynor’s mind and heart witnessing the little things that made him truly love this woman. I also liked to see some of the Hyperion characters found in-game make more than just cameos: Dr. Egon Stetmann and Chief Engineer Rory Swann. The in-game cutscene showing the Cantina fight between Jim and Tychus is referenced. Some in-game funny moments such as Matt Horner’s embarrassment with his Deadman’s Port wife — this is the pirate space junkyard planet players are acquainted with. 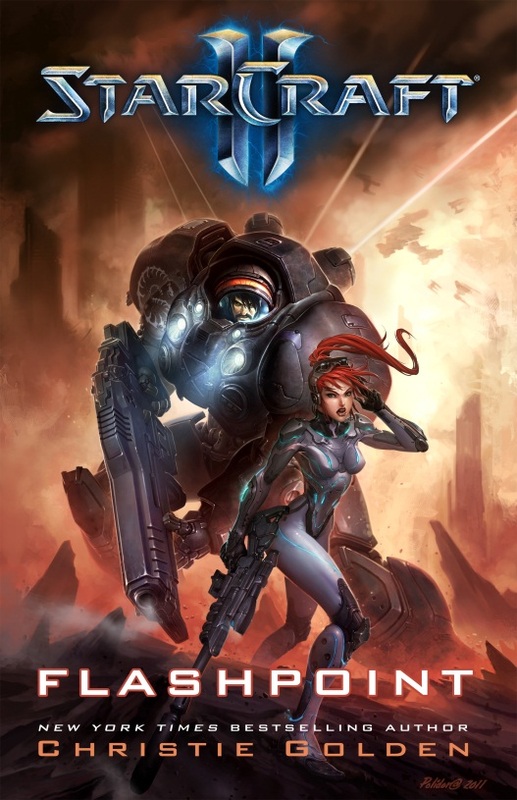 The novel displays the accurate dialogues between Raynor and Valerian as seen in StarCraft II: Wings of Liberty through flashback. In another scene, Valerian is at the Hyperion cantina and he’s wondering about the jukebox wrapped above on the ceiling, and smirks at listening to the song “Suspicious Minds”. I really love to read consistency, continuity, and nods to previous games and StarCraft novels. Christie Golden doesn’t ignore those small details. That’s something fans of the game will truly appreciate. StarCraft: Flashpoint also reveals the first time Raynor met Matt Horner before Mengsk’s betrayal on Sarah. There is also a nod to Chris Metzen’s story (Homecoming) in StarCraft: Frontline. Jim Raynor’s son and former wife are mentioned a few times. There is one Raynor’s Raiders traitor who might not return as part of the Hyperion’s crew in StarCraft II: Heart of the Swarm, but I got a feeling we might see him at some point. Christie Golden’s writing is non-stop action, with spiraling emotions, plenty of humor, and readers will find the many unpredictable turns very exquisite and satisfying. Cherry on top — we learn more about Narud and the Moebius Foundation. 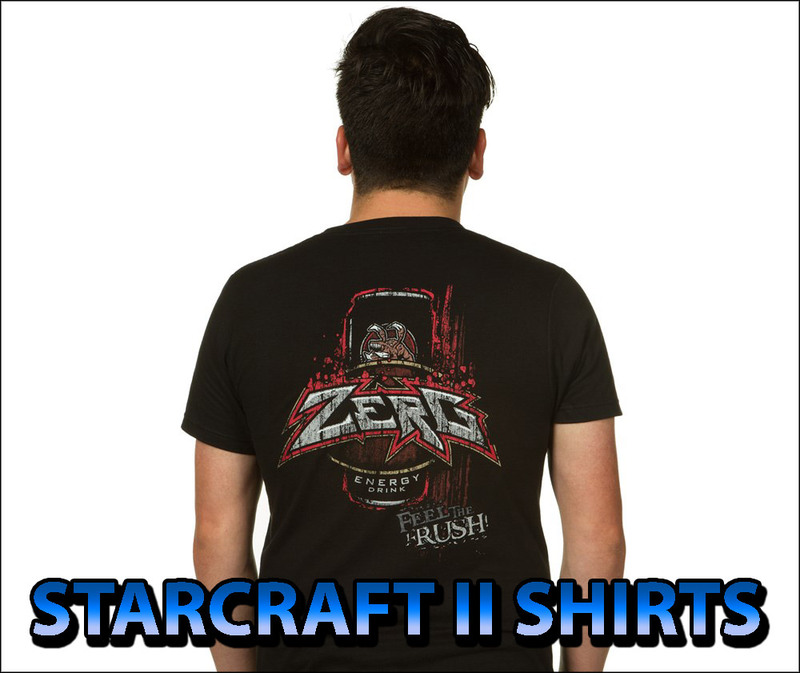 Get your hands on StarCraft II: Flashpoint to find out. It’s worthwhile. I recommend reading it on a Saturday morning. Once you start reading, you will hardly have a chance to play or do domestic chores. You won’t be able to stop reading till the end with all the action and suspense. I can hardly wait to play through the StarCraft II: Heart of the Swarm single-player. StarCraft II: Flashpoint goes on sale on Tuesday, November 6th, 2012. If you haven’t yet, pre-order StarCraft II: Heart of the Swarm. However, make sure to order it separately so both items ship individually. Lisle – stayed behind to protect the Xel’Naga artifact. Haynes – stayed behind to protect the Xel’Naga artifact. Captain Sharyn Moore (flashback) – Captain of the Cormorant (old merchantman vessel) that transported Jim and Sarah to Orna III. Matt Horner’s former captain and ship. Boots (mentioned) – Sarah’s pet for three weeks. Gary Crane – one of Mira Han subordinates at Deadman’s Port. Liddy (flashback) – Jim Raynor’s former wife. Died of cancer. (StarCraft: Frontline Vol. 4 — Homecoming by Chris Metzen). Dr. Chantal de Vries – one of the many doctors in the Space Station Prometheus who toured Dr. Stetmann. Elias Thompson – chief engineer of the Bucephalus. G-2275 (mentioned) – gas giant, technological hub of the Confederacy. Raynor and Sarah were at its moon after the victory at Antiga Prime. They retrieved the plans to create upgraded Goliaths. Orna III – science facility doing covert experiments on their citizens such as gene-splicing, brain modification, telepathic experimentation, disease testing. Valerian brought 25 battlecruisers to planet Char. Only fourteen survived the Zerg. Some of the battlecruiser names: Aenas, Amphitrite, Metis, Eos, Patroclus, and Meleager, Antigone, and Herakles. Battlecruiser type mentioned: Minotaur-class and Behemoth-class.